Australian prosecutors have dropped their case against a man who had been accused of murdering a UK-born toddler almost 50 years ago. 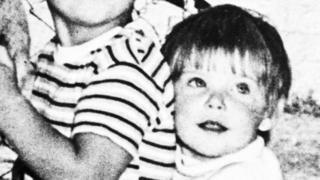 The disappearance of three-year-old Cheryl Grimmer from a New South Wales beach in 1970 is one of Australia's longest-running mysteries. A man was arrested in 2017, and he later pleaded not guilty to murder. On Friday, a judge ruled that a key part of the prosecution case could not be used as evidence in a trial. It concerned statements made by the man during a police interview in 1971, when he was aged 17. The Supreme Court of New South Wales found that the evidence could not be heard because the teenager had not had an adult representative present during the interview. Justice Robert Allan Hulme said: "The Crown accepts that its case cannot succeed without it." Cheryl went missing from a shower block on 12 January, 1970, in Wollongong, a city 70km (44 miles) south of Sydney, shortly after her family moved to Australia from Bristol. On Friday Cheryl's brother, Ricki Nash, said the family was devastated by the latest development and felt let down by police. "We're just a bit numb, a bit shocked… no words can describe how I feel at the moment," he said outside the court. Over the years, the family had expressed frustration at the lack of progress in the case. Another of her brothers, Stephen Grimmer, said in 2016: "My mum and dad have passed on now not knowing, and we want to know too before we pass on." In explaining his decision, Justice Hulme acknowledged that the man had made a written statement and engaged in a "walk-through style interview" with police in 1971. Unlike now, minors were not legally required to be accompanied by an adult when giving such statements. However, Justice Hulme ruled that the man's police interview "should be excluded on the basis of unfairness". He also noted testimony from psychologists who had reviewed the case for the trial. They found that the man had "low intellect" and would have been "more vulnerable to influence" at the time, the judge said. The man's trial had been due to begin in May.